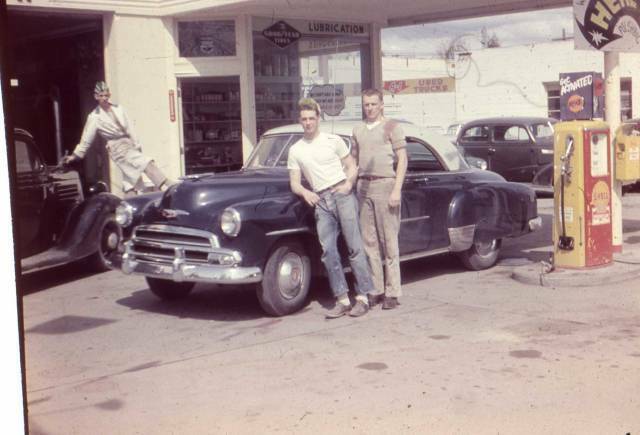 1950's Gas Station Photo Shoot Photo Picture Classic Cars for sale & Classifieds - Buy Sell Classic Car & Classic Truck Classifieds. Posing at the Gas Station in front of their pride & joy. 49-51 Ford coupes were nice but the hard top they made in that body style was ugly to me.49-52 Chevy hard tops like this one were nice.Last year of this style 1952 had teeth in grill.Whats the young pump jocky on the left standing on?Guess he is ready to check your oil,water,fill you up with gas,clean windshield,give you glass ware,and green stamps.Ha ha.You other old ones recall it all I bet. I HAD THE SAME POSE ON MY 51 CHEVY H.T.IN 1963!! AAAAHH ,MEMORIES!!!! !